"Le Creuset" means "the cauldron", or "crucible" or "melting pot", referring to the vessel in which iron is melted for casting. The signature red-orange color known as "flame" is said to have been intended to be reminiscent of the color of molten iron. Raymond Loewy, who designed several pieces for Le Creuset in the 1950s, is also known for, among many other industrial designs, the redesign of the classic Coca-Cola bottle. 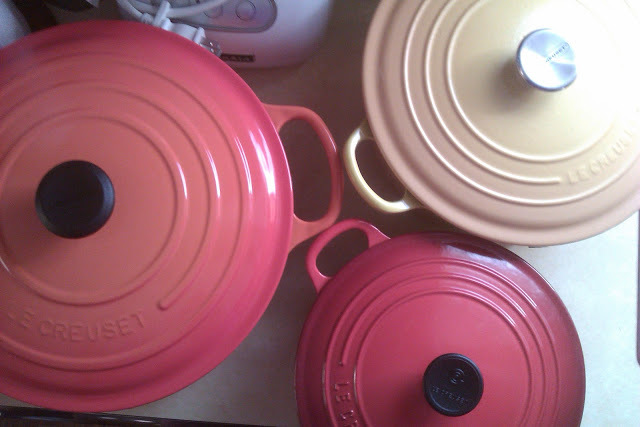 Over the years, several changes were made to the design and finish of Le Creuset enameled cookware. Loop style lid handles were replaced by phenolic and stainless steel knobs. Pieces from the 1950 and 1960s, for example, are seen with ribbed bases. Later, in the 1980s, pots were produced with flat, unenameled bottoms. Pieces are also seen with black interiors with raised ridges on the bottoms. Current designs include flat, enameled bottoms, likely due to the increasing popularity of glass cooktops. The "Signature" series, introduced in 2010, includes improved phenolic lid knobs good to 480°F/248°C, larger, more ergonomic loop pot handles, and sand-colored interiors with improved durability and stain resistance. Earlier, "classic" phenolic knobs were only oven safe to 375°F/190°C. Areas like lid and pot rims which appear to be bare iron are actually coated with a clear glaze to seal them against rust. Signature series features vs. previous "classic". What do the numbers and letters molded into pieces of Le Creuset mean? The two-digit number signifies the item's diameter or long dimension, without handles, in centimeters. Note: Tring to find a matching lid to fit a lone pot may not be as easy as matching the letters. At some point, oven sizes were changed resulting in different capacities from previous, but retaining the same series of letter designations. Therefore, all letter "C" lids, for example, will not fit all letter "C" pots of the same shape. New factory seconds with minor cosmetic blemishes are available from a variety of sources, including factory outlet stores. They are marked and priced as such and are easily discernable by the orange-colored labels so-stating. Irregularities may include dull spots, runs, bubble pops, pinpoint voids, and waviness in the enamel finish, or very minor roughness of uncolored edges. Factory store personnel are generally quite helpful, and typically even let the buyer pick and choose from multiple items of inventory. Periodic sales make the "second choice" items even more attractive bargains. 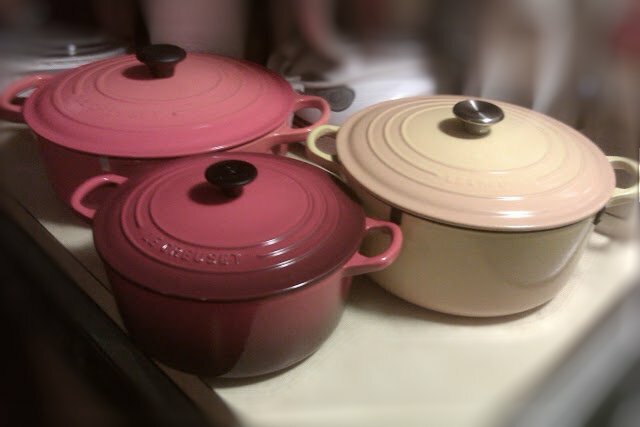 The regular Le Creuset warranty applies. In addition to a full line* of "first quality" and "second choice" items, also sold in the factory stores are classic pieces from their Heritage Collection, whose designs date back to the earliest days of Le Creuset. *Some colors may be exclusive to certain retailers and not available.